Thinking of gifting a home video fan a fresh new Criterion Collection release in December? (Of course, you can always gift yourself.) Here are your options. The first black woman to direct a Hollywood studio film, Euzhan Palcy made history with the blistering drama A Dry White Season (1989). 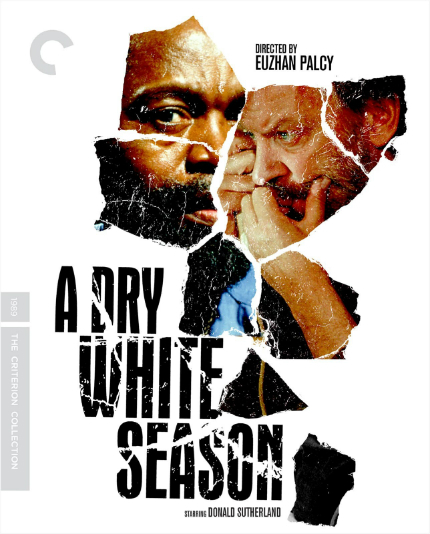 White schoolteacher Donald Sutherland sees his gardener (Winston Ntshona) suffer "a wave of brutal repression" and finally takes notice of what's been going on in his country for many years. On a less serious note, Sam Fuller's Forty Guns (1957) stars Barbara Stanwyck in "the pulp maestro's most audacious Western," which is really saying something, if you know the work of Sam Fuller. Barry Sullivan also stars. "Based on a novel by Georges Simenon" always sounds like a good idea. Julien Duvivier's Panique (1946) takes on the mob mentality as an antisocial man is framed for a murder in post-war France. Michel Simon stars. Of course, what would the holiday season be without Ingmar Bergman (?!). His Sawdust and Tinsel (1953) follows a circus owner and his mistress and is said to feature "dreamlike detours and twisted psychosexual power plays." So, maybe not a date movie, but better suited for longtime couples? Read more about the extras featured on each disc at the official Criterion site.